Contribute to the Fight Against Breast Cancer! But the news isn’t all bad. Since 1989, the number of deaths from breast cancer has been decreasing every year, and that’s because of improved research, awareness and early detection. Statistics like this are how we know that Breast Cancer Awareness Month is a valuable tool in winning the fight against breast cancer. Every penny that goes towards research and education is saving lives. 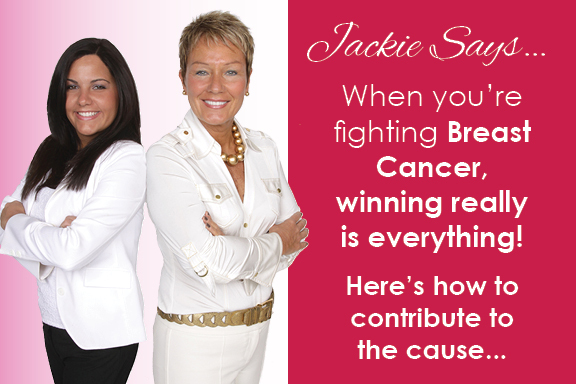 Sunday, October 18, 201510 a.m.
Our local Rockaway Townsquare Mall has partnered with Susan G. Komen Foundation for an October full of fundraising events – many of which will save you money at shops within the mall in exchange for your donation. Liberty Village Premium Outlets is teaming with Susan G. Komen® to support breast cancer awareness, outreach, research, and treatment programs in its local community. Now through Oct. 31, shoppers can visit the on-site Information Center to donate $10 to benefit Komen and then enjoy a day of shopping at the Premium Outlets® Pink Event. For each donation of $10 or more, shoppers will receive a special savings card filled with “25% off one single item” offers from Brooks Brothers, Le Creuset, Michael Kors, J. Crew, Michael Kors, Polo Ralph Lauren Factory Store, Tommy Hilfiger and more. This year, more than 40,000 people will die from breast cancer. That’s too many … which is why Saint Barnabas Medical Center, Barnabas Health Ambulatory Center, The Mall at Short Hills and partner stores are on a crusade, The Pink Crusade. Visit Grand Court from October 1-31 to view the striking exhibit showcasing survivor stories and important information that every woman should know about early detection for Breast Cancer. While there, dedicate a ribbon for the Pink Ribbon Garden. Then stop by Guest Services and complete a Breast Health Awareness quiz to be entered into a drawing for the chance to win a $250 Mall at Short Hills’ Gift Card and to receive a complimentary gift. Be sure to visit The Pink Crusade partner stores listed below to receive valuable health tips. Participating stores: Agent Provocateur, Allen Edmonds, Anne Fontaine, The Art of Shaving, Au Bon Pain, Aveda, bareMinerals, bebe, Bloomingdale’s, Brighton Collectibles, Brooks Brothers, Brookstone, California Pizza Kitchen, Calypso St. Barth, Chico’s, Club Monaco, Crabtree & Evelyn, Crate & Barrel, Exuviance Skin Lab, Gap/GapKids, Geox, Ghurka, Godiva Chocolatier, Joe’s American Bar & Grill, Karen Millen, kate spade new york, Kiehl’s Since 1851, La Maison du Chocolat, Landau, Links of London, Molton Brown, Montblanc, Omega, Optica, Pandora, Papa Razzi, Paradise Pen Company, Peloton, Piazza Sempione, Pildes Optical, Polo Ralph Lauren, Pottery Barn Kids, Qdoba Mexican Grill, Robert Graham, Sephora, Sidney Thomas Jewelers, Solstice, Spanx, Teavana, Thomas Pink, Tourbillon, True Religion Brand Jeans, Van Cleef & Arpels, Verizon Wireless, Vilebrequin, Vineyard Vines, The Walking Company, Wentworth Gallery, Woops! Bake Shop and XXI Forever.